We are very proud on all of our students! 26235 AATG Level 1,2,3,4 Exams in 2017. 8,428 students received medals for their outstanding performance on the 2017 National German Exam. AATG honored 3,331 students with Gold Medals. 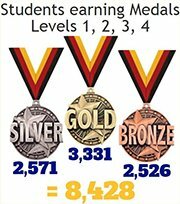 2,571 students received Silver Medals and 2,526 students were awarded Bronze Medals. On behalf of the Executive Council of the American Association of Teachers of German, I would like to commend the excellence of our 2017 National German Exam Gold, Silver, and Bronze Award Winners. The outstanding performance of these German learners in our national competition brings honor to their school, their district, and their German program. The AATG salutes the tremendous work of these students and their dedicated teachers. We wish our Award Winners continued success in German! 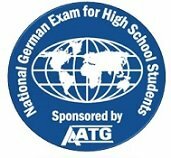 The National German Exam is administered each year to nearly 22,000 high school students in the 2nd, 3rd and 4th level of German. The Exam, now in its 56th year, provides individual diagnostic feedback, rewards students through an extensive prize program, and creates a sense of accomplishment. Each Exam is comprised of 100 questions. Question types include multiple choice, matching, and true/false. The Exam is comprised of two parts. The listening and viewing portion is 40 minutes in length and consists of a series of short audio and video segments with a total of 50 questions and tasks. The reading portion is 45 minutes in length and consists of a number of print texts, including graphs and images with a total of 50 questions and tasks. All materials used in the exam are from authentic resources. The Exam will NOT include any text completion questions.